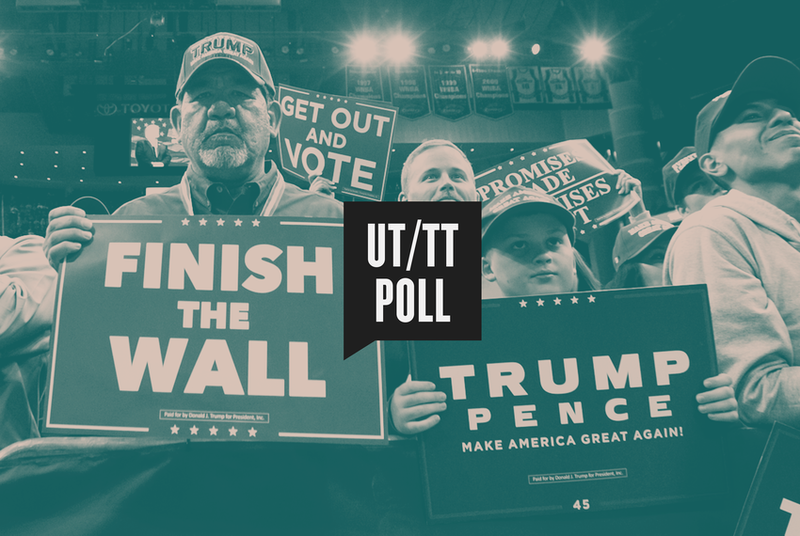 Ask Texas voters what they think about any particular Trump administration policy, and their answers will tell what parties they're in, according to the latest University of Texas/Texas Tribune Poll. Texas voters’ opinions of President Trump mirror their partisan identification, according to the latest University of Texas/Texas Tribune Poll. Republicans like him. Democrats don’t. Take that notion out for a road test. Does he have the temperament to serve as president? Is he honest and trustworthy? Is he competent? Does he care about people like you? Is he a strong leader? Is he knowledgeable? Between 78 percent and 91 percent of Republicans said yes to each question. Among Democrats, between 4 percent and 10 percent said yes. Similar partisan stripes run through other poll results on the president. Overall, Texas voters appear to be split when asked about his handling of trade negotiations (47 percent approve, 43 percent disapprove); about immigration/border security (47 percent approve, 45 percent disapprove); and judicial appointments (49 percent approve, 43 percent disapprove). “Donald Trump is the personification of partisanship — for both sides,” he said. When the voters are separated by party, those parties might as well be named Trump and not-Trump. On trade, 84 percent of Democrats disapprove of his work, while 86 percent of Republicans approve. On immigration/border security, 86 percent of Democrats are against him and 86 percent of Republicans are with him. And on judicial appointments, 87 percent of Democrats disapprove of Trump’s actions, while 89 percent of Republicans approve. As views of the president go, so go the views of his perceived foes. Among all Texas voters, 38 percent have favorable views of the FBI, which has been conducting an investigation into the Trump team's alleged ties with Russia, and 31 percent have unfavorable views. Among Democrats, the FBI gets positive marks from 54 percent, negative marks from 17 percent. Among Republicans, views of the nation’s top law enforcement agency are 27 percent positive, 45 percent negative. Likewise, voters’ opinion of special counsel Robert Mueller's investigation of Russian interference in the 2016 election is colored by partisanship. Overall, 34 percent approve and 40 percent disapprove of his work. Among Democrats, 62 percent approve. Among Republicans, 68 percent do not approve. “The election has not done much to soften views of Mueller or the FBI,” Henson said.